Useful in in vitro cell growth assays with possible applicability to a variety of problems in cellular pharmacology and biology. An improved colorimetric assay for cell proliferation and viability utilizing XTT has been reported. An XTT-based colorimetric cellular cytotoxicity assay for melanoma and other tumor cells has also been reported. Berridge, M. V., Herst, P. M., & Tan, A. S. (2005). Tetrazolium dyes as tools in cell biology: New insights into their cellular reduction. Biotechnology Annual Review, 11, 127–152. Meshulam, T., Levitz, S. M., Christin, L., & Diamond, R. D. (1995). 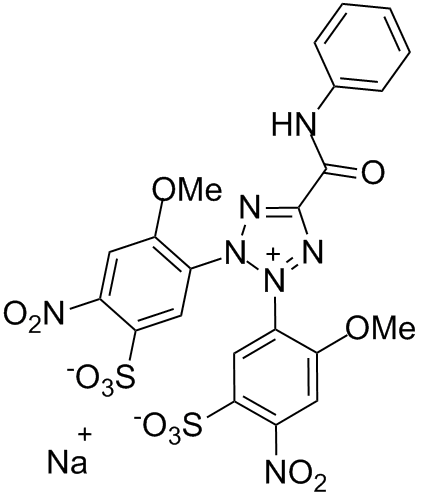 A simplified new assay for assessment of fungal cell damage with the tetrazolium dye,(2, 3)-bis-(2-methoxy-4-nitro-5-sulphenyl)-(2H)-tetrazolium-5-carboxanilide (XTT). Journal of Infectious Diseases, 172(4), 1153-1156. Roehm, N. W., Rodgers, G. H., Hatfield, S. M., & Glasebrook, A. L. (1991). An improved colorimetric assay for cell proliferation and viability utilizing the tetrazolium salt XTT. Journal of Immunological Methods, 142(2), 257–265. Scudiero, D. A., Shoemaker, R. H., Paull, K. D., Monks, A., Tierney, S., Nofziger, T. H., … Boyd, M. R. (1988). Evaluation of a Soluble Tetrazolium/Formazan Assay for Cell Growth and Drug Sensitivity in Culture Using Human and Other Tumor Cell Lines. Cancer Research, 48(17), 4827–4833.